Delicious, tailored and convenient, Quattro Foods ambient sauces for restaurant, wholesale and retail food providers are a time-saving food manufacturing solution designed for busy chefs in commercial kitchens. From ginger puree to sun-dried tomatoes, from ready to use sauces to salad dressings, our extensive range comprises food products made from ingredients that are designed, prepared and delivered by professional chefs for professional chefs around the UK. 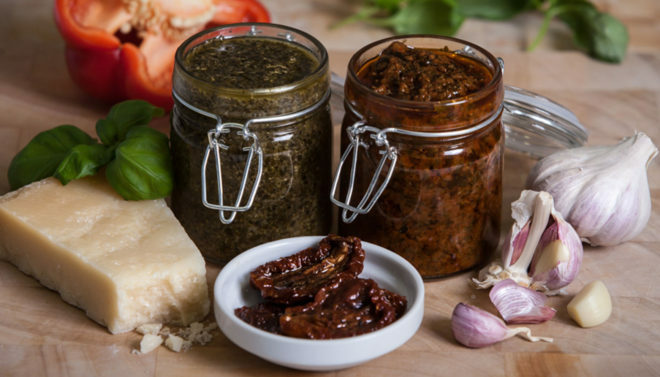 Our ambient range includes salsas, a variety of pestos and curry pastes, pasta sauces, Thai and Indian curry pastes, chopped garlic in oil, chutney and a range of table condiments. Our customers are professional chefs looking for food products and ingredients to enhance their offerings and delight their customers. Brown sauce, BBQ sauce and chilli sauce are a few of our many bespoke ambient products designed for discerning kitchens looking to complement their culinary offerings with versatile, tasty and innovative flavours and textures. These food products ultimately reach high street retailers, cafes and restaurants, ensuring that Quattro Foods delivers taste sensations to everyone. Designed to increase shelf life – Quattro Foods ambient range is created by an innovative manufacturing process and controls that ensure the food lasts longer. We pride ourselves on offering the highest customer care throughout the consultation, design, manufacture and delivery of your range of ambient products. Come to Quattro Foods for the ultimate ambient taste.